In this series we’ve examined types of trust, the benefits of high-trust partnerships, the role of goodwill in trust building and how formal governance mechanisms can foster or impede trust building. Now we turn our attention to governance by trust, a direct form of informal governance. This week, we’ll tackle relational governance in three bites: norms, values & goals; joint planning & problem solving; and bilateral communications. Indirect experience i.e., reputation – where a third person, group or organization acts as a proxy and provides information about a potential partner (Week 8). Sometimes called governance by “goodwill trust” or a form of benevolence, relational governance has been shown by many scholars to be more efficient and less expensive than formal control mechanisms (Bachmann & Zaheer, 2008; Claro et al., 2003; Das & Teng, 2001; Dyer & Singh, 1998; Gulati, 1995; Zaheer & Venkatraman, 1995). Think of the savings that are possible if organizations reduce or eliminate contracting costs alone! Since this is the case, firms that can rely on informal governance mechanisms to create stronger forms of trust (Week 2) have a cost-based competitive advantage over competitors who have to rely on economic hostages, contracts and supervision (Barney & Hansen, 1994, p.183). Relational governance mechanisms include: common norms and values, goal congruence, joint planning and problem solving, and bilateral communication. All of these foster cooperation and limit opportunism (Claro et al., 2003; Poppo & Zenger, 2002; Woolthuis et al., 2005; Zaheer et al., 1998). 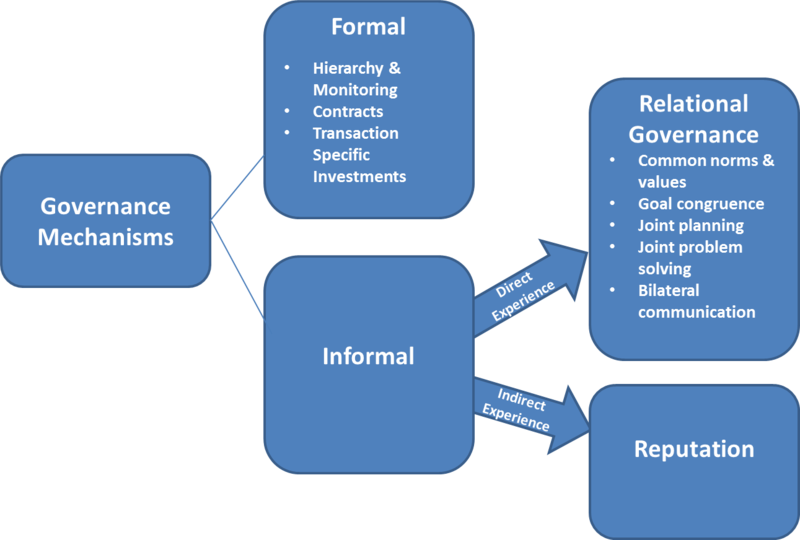 Each of these informal governance mechanisms can create trust on a stand-alone basis. 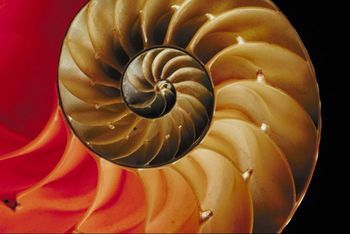 They are also intertwined to jointly create a powerful and positive spiral of growing trust. Shared values are a “direct precursor of both relationship commitment and trust” (Morgan & Hunt,1994, p. 25). When norms create “thick trust”, the thick trust substitutes for complete contracts and is a superior governance mechanism due to the positive ‘side effects’ of constructively solving conflicts and loyalty (Woolthuis et al.,2005). Common values and norms improve exchange performance by reducing governance costs and making individual and collective behaviours more predictable thereby reducing the risk of opportunism. Relational norms have “strong effects on sales growth, financial performance, cooperation and [reducing] conflict…and provide an important backdrop for other focal performance drivers” (Palmatier et al.’s, 2007, p.183). In case you think that trust and relational governance is all a little “airy fairy” and naïve, norms also work from a punitive perspective because players who do not cooperate or follow the rules of the relationship or culture face ostracism and reduction of current & future opportunities (James, 2002). That’s a hard financial incentive to play by the rules. While this approach assumes coercion and power rather than trust, it still supports the role of norms as a strong source of internally created and imposed governance. A number of conceptual papers, and the common knowledge, surrounding goal congruence and trust is that trust builds after numerous inter-personal interactions over time. This gives people a chance to experience goodwill, to test one another’s credibility and to deepen their understanding of one another’s role constraints – which all contribute to increased trust (Ring & Van de Ven, 1994). In an iterative approach, people develop empathy and a common-interest (identity-based trust) as they work together over time (Hexmoor et al., 2006; Lewicki et al., 2006). Trust between individuals can transfer to the group and eventually to the organization. Convergence of values and goals lead to identity trust which, in turn, strengthens the convergence of values, attitudes and goals– a positive, virtuous cycle (Gulati & Sytch, 2008). However, goal congruence does not have to take time, i.e., be iterative and cumulative. This is one of Trust’s Big Myths! 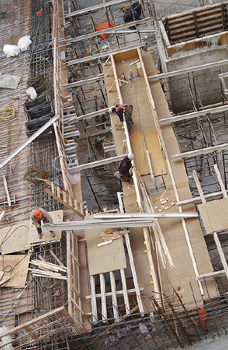 In large-scale international engineering projects, contracts provide high level goals and direction and “necessitated general trust is extended to everyone even without prior knowledge” (Girmscheid & Brockmann’s, 2010, p.353). People use one another’s competencies, training and certifications (intsitutional trust) as a shortcut to extend trust. Imagine a large-scale disaster relief scenario. The various organizations don’t have the time to get to know each other slowly and build common values, norms and goals over time, they have to go on competencies and common objectives. Set the direction of the alliance (Das & Teng, 2001). Meet the fundamental business ethics requirement that “both organization and individual needs will be achieved best by pursuing collective ends (Hosmer, 1996; Caldwell & Karri, 2005). “There has to be a common interest, so that if a project partner screws up the project he also spoils it for himself” (Laan et al., 2011, p.104). Do you have experience with swift trust between organizations? How about a scenario where goals were not aligned in a business partnership? How did you realign the situation? I’d love to hear about it. I hope to see you at Part B when we explore Joint Planning and Problem Solving as informal relational governance mechanisms.